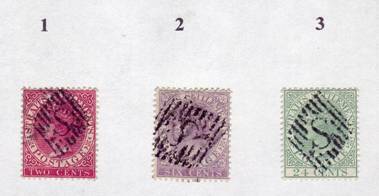 I recently purchased several Straits Settlements stamps with the Sarawak "S" overprint on each. However, there appears to be a clear difference in the size of the "S" and diamond between them. The large "S" in diamond overprints are items 2 & 3, however, the overprint ink shows through on the backs of items 1 & 3. The larger has a diamond size of 14.5mm and on the smaller is 12.5mm. Other examples I have all appear to be 12.5mm in size. 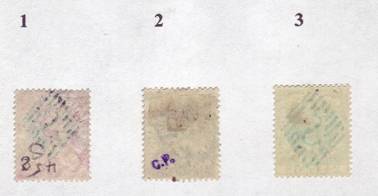 I have attached two scans showing the backs & fronts of 3 examples I purchased. Is the larger overprint a forgery? No's 1 and 3 where the ink shows through the back I believe are forgeries - I purchased a very similar item via ebay (where else!) from I believe a dealer in Israel - when I asked where they came from them he claimed he found them in a large accumulation of SS stamps he purchased. No 2 is more interesting and I reserve judgment. Regarding the S in diamond. I must have seen many thousand S in diamond over the year but this is the first time I have seen the large size. There have often been suggestions that there were at least two of the S in diamond cancellers in use at the same time, and this may well be true although it has never been possible definitely to separate them. The small size example appears to be genuine - I would need to see the stamp to be sure - and is not rare in this form. Having said that, it does appear to be rather 'rough' and of uneven impression, which is unusual - it is usually quite crisp and clear. As to the larger one, had it been in use in Sarawak I am sure that it would have just as plentiful as the smaller one and this, manifestly, is not so. We are again left with the almost certainty of a forged canceller, probably of Singapore origin. I agree with Jon & Bill’s comments. With Nos 1 and 3, the size and lack of sharpness combined with the ink being visible through the back strongly suggest a forged cancellation to me. No 2 has a double strike and is harder to see. In my experience forgers tend to apply forged cancels with care! Like Jon I would reserve judgment.